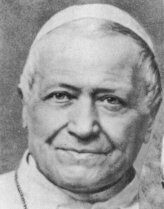 No other successor of St Peter has worn the Roman triple crown for as long as Giovanni Maria Conte Mastai-Ferretti, who ascended to the papal throne as Pope Pious IX in 1846. Pope Pious' pontificate was notable not only for its length, but also for the decisions the pope made which were to have a significant effect on the future, for instance the defence of the sovereignty of the papal state during the Italian war of independence, the convening of the first Vatican Council, the dogma of papal infallibility, and the completion of various concordats. In his youth, Pious IX had a sickly constitution and suffered epileptic seizures. In 1895, the 23-year-old Count Mastai-Ferretti requested to be accepted in the papal guard. However, because he had epilepsy, his name was removed from the list of candidates. Vinzenz Pallotti, who later founded the Pallottins (an association of priests and monks working to promote the Christian faith) and the friend of the young count, consoled him with the words: 'Be comforted. You will not keep guard, you will be guarded', and he was right! After making a 'recovery', he was ordained at the age of 27 (1819). During the time he spent as priest, bishop, cardinal and pope (from 1846 on), epileptic seizures are never mentioned. Pope Pious' frail health in his childhood and the epilepsy he suffered as a young man do not appear to have diminished his creativity and steadfastness in the face of the immense mental and physical strain of his papacy in turbulent times (which included his flight from Rome, exile and imprisonment). Pious died in 1879 at the age of 85.